Alchemist 112 Combo, Tube Combo Guitar Amp from Bogner in the Alchemist series. Even from childhood, in his native Germany, Reinhold Bogner was already skillfully wielding his soldering iron to create his own guitar amps. After he moved to Los Angeles, his models and amp modifications began to attract famous names from the six-string world including Steve Vai, Steve Stevens, and Eddie Van Halen. So when it was announced that he was putting out an amp made in Line 6's factories that would cost less than $1500, it made a big noise. Even from childhood, in his native Germany, Reinhold Bogner was already skillfully wielding his soldering iron to create his own guitar amplifiers. After he moved to Los Angeles, his models and amp modifications began to attract famous names from the six-string world including Steve Vai, Steve Stevens, and Eddie Van Halen. So when it was announced that he was putting out an amp made in Line6's factories that would cost less than $1500, it made a big noise. This new model, called the Alchemist, a handsome-looking 40W tube-amp, is exactly what we'll be testing. It comes in three models: two combos: the first equipped with a 12-inch loudspeaker and the second with two different 12-inch speakers; and an amp head + 2x12 cabinet. This review is about the 2x12 combo model. It's pretty bulky, (two 12-inch speakers take up a bit of space!) heavy (80 lbs), and has a very nice neo-vintage look to it. Everything looks solid and ready to take a beating. 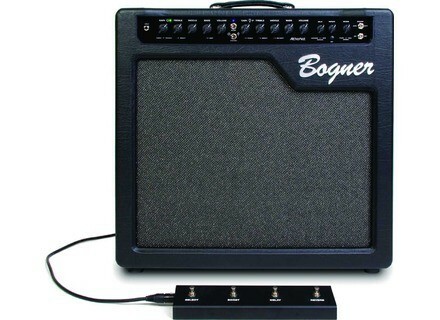 Even though it's manufactured in Line6's shops, it's still a Bogner! Other more expensive models of the brand therefore become "Custom Shop" class. As for looks and finish, the grid, the logo, knobs and small diodes all look well made and give the amp a respectable look. Everything about the amp exudes the quality of the brand. One look at the specs is enough to see that it's really got 40-Watts (class-AB power) under the hood, but you can also reduce the power by half. This is very handy when you want to stay in good relations with your neighbors while pushing the amp a little... Careful however, because even at 20 watts, the Alchemist produces some serious sound! As for tubes, it's got two 6L6 power tubes and five 12AX7 preamp tubes; pretty classic. 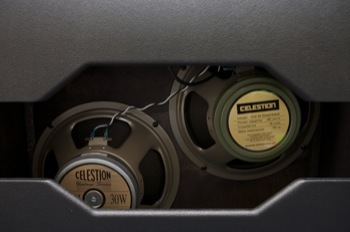 As for the two 12-inch speakers, this amp features a Celestion G12M Greenback and a G12H Anniversary Celestion. This configuration is rather interesting, because you'll be able to get two quite different sounds during recording: nice touch! The Alchemist therefore includes conventional, but quality, components. In terms of inputs and outputs, there's of course the guitar-in on the front panel, plus two speaker outputs (8/16 Ohms and 4 Ohms) on the back panel. 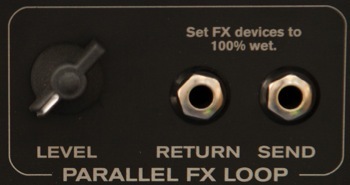 An XLR connection is used to connect a 4-button footswitch (included) to control channels, boost, delay, and reverb. Lastly, there's an FX loop and blend knob. Note that the loop is buffered and non-bypassable so the "dry" signal never leaves the amp, so as to not to degrade the signal with an external element. 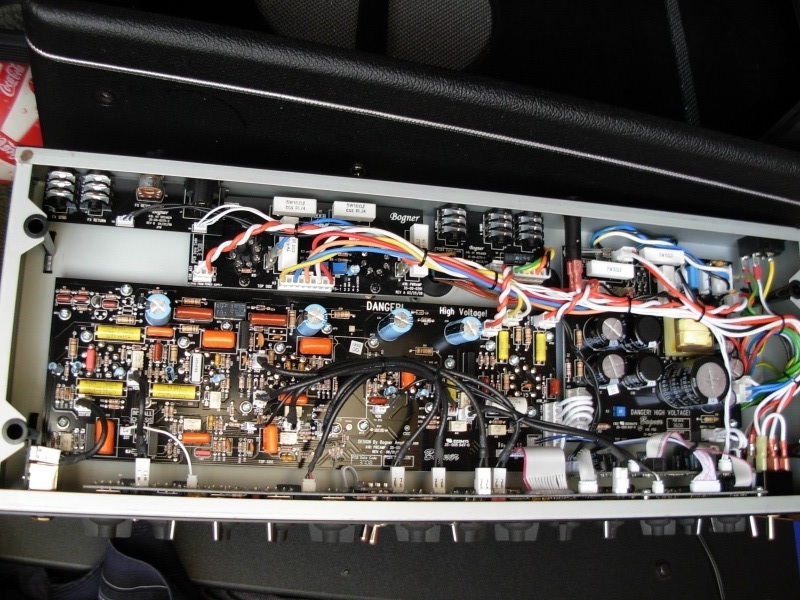 Here's the inside of the amp. As for settings, keep in mind that the amplifier provides two channels: the "Gold" channel which is intended to excel at clean and crunch sounds, and the "Mercury" channel, which turns to higher gains. For the first channel there are typical knobs: gain, bass, mid, treble, volume, plus various switches: Clean/Crunch, Bright, and Deep (to add low-mids and bottom-end). Above the Gold/Mercury switch there's a Boost switch which, when applied to the Gold channel, adds gain and thickness (with more low-mids to your sound). 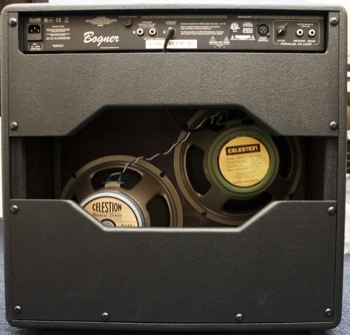 On the Mercury channel, the boost adds gain and fattens your sound without necessarily increasing its volume. For this second channel, there are also gain, volume, and EQ knobs but also a Punch switch which, when set to the left, gives a more classic Californian tone, and when set to the right, a more British high-gain tone. The Mid Shift switch will cut mid frequencies. In terms of effects, the Alchemist features a delay (with a tap delay button that lets you quickly adjust its speed to tempo) with three types: ducking (quick cuts), analog, and tape (tape delay). It's also possible to adjust the number of repetitions via the 'Repeats' knob. The amp also features three reverbs: spring, hall, and plate selectable via the appropriate switch. Given the number of switches, there should be a lot of sonic “alchemy” possible ... Let's check it out! The samples recorded with a Hamer reveal a rather fat and gritty sound, but slightly muddy, which may please some and annoy others ... It's a matter of taste! This amp is recommended more for fans of stoner rock rather than shredders who usually prefer a very precise and cutting sound. The amp has a tendency to lose definition in the low-mids. You get the impression that it responds more like a vintage amp rather than a modern hi-gain amp. With regard to my own sound samples, a Gretsch G5129 was used, equipped with DeArmond single coil pickups and a Sennheiser MD421 microphone placed in front of the amp. A tip for mic placement with this amp: there's a wooden bar placed vertically in the center of each speaker, which is convenient as a marker for placing the mics in front of the speaker cones, since the covering is opaque. 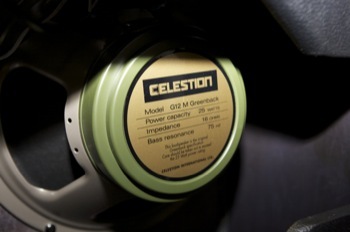 First here's the sound from each speaker, with the same settings on the amp and guitar: the Celestion G12M Greenback and G12H Vintage. You can hear a definite difference between the two speakers which in turn multiplies the tone possibilities. The other examples were made with the G12M Greenback. Not too many surprises, the samples confirm what was said above. The delays are pretty classic sounding and can give your sound a nice coloring if used sparingly. Same for the reverbs: quite nice sounding and very appropriate for most situations. These sound examples were designed to enable the reader to hear the difference between each switch of the amp. 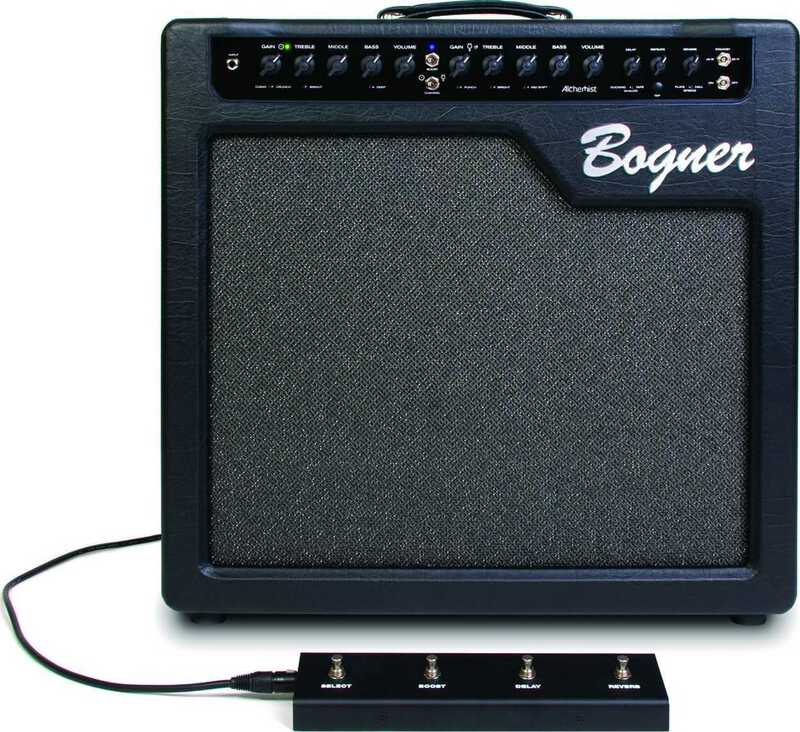 Bogner set out to make an accessible amp and it seems he's succeeded. We are in the presence of an amplifier that costs less than $1500 (for the 2x12 model) with two channels with very different personalities and two speakers that considerably expand its sonic palette. Add to that a small neo-vintage look, a clean sound that crunches as it should and a fat distorted tone and you get an amp that's built to please. Of course, those who love to complain will say that it weighs a ton, that you'll need tweezers to tweak the tiny switches, and that it's impossible to get a modern shred-like distortion tone out of it. They wouldn't be wrong. But the Alchemist has personality, and that means it probably won't please everyone ... But what guitar amp does? 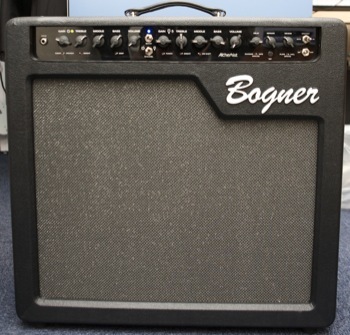 A Bogner for less than $1500! Distortion sounds that won't appeal to everyone!